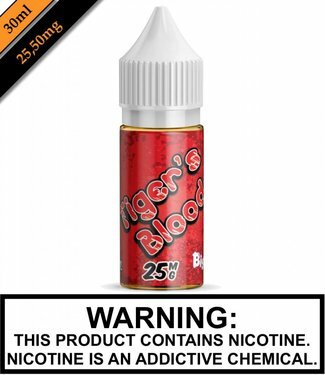 The eliquid is just the right mix of berries you just can't ..
Big Salty Deal - Crsp - Fruity Pebbles and Frosted Flakes Ri..
Make your mouth happy with Happy Melon. A watermelon hard ca..
Grape Soda plain and simple. Who doesn't love a ice cold gra..
Big Salty Deal - Tiger's Blood - Strawberry, watermelon, and..
Amazing Mango features a mango, peach, and cream blend with ..
Naked 100 Salt - American Patriots - ride with a classic cut..
Naked 100 Salt - Brain Freeze - features perfectly ripe stra..
Green Blast pairs honeydew sweetness with the juicy, fresh t..
Hawaiian POG brings a delicious blend of freshly squeezed Or..
Naked 100 Salt - Lava Flow - Tropical combination of strawbe..
Naked 100 Salts - Maui Sun is a sweet, tangy, and juicy gold..
Naked 100 Salt - Polar Breeze - tropical refreshment-sweet, ..
Naked 100 Salt - Really Berry - not your typical berry flavo.. Very Cool takes freshly picked Blueberries, Blackberries, an.. Ripe Collection Salts - Apple Berries is another fruity sens.. They took ripe blueberries, juicy raspberries, and plump pom.. The most exquisite fuji apples and super fresh guavas all b.. Ripe Collection Salts - Kiwi Dragon Berry - Delicious kiwi c.. This juice is a tropical delight of juicy peaches, ripe mang..